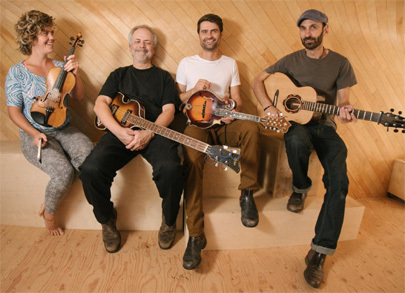 North Vancouver's Keith Bennett is a veteran musician who performs and teaches worldwide. Best known for his mastery of the harmonica, he is also an accomplished guitarist and singer. His melodious harmonica playing has been featured with the Vancouver Symphony Orchestra and on over 200 CDs & soundtracks for film and television. 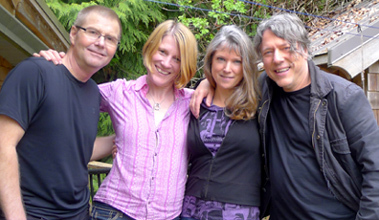 With Keith are two of the Coast's favourite Vancouver musicians, Michael Creber and Jodi Proznick. 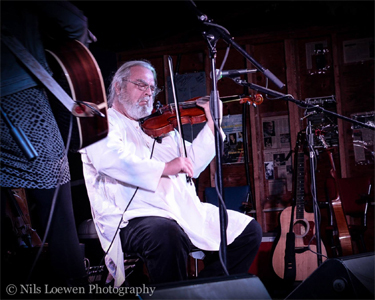 Michael Creber is one of the West Coast’s most sought-after musicians, both onstage and in the recording studio. He pursues a wide-ranging career as a keyboardist, composer and producer, embracing many areas of popular music including jazz, Latin, R&B, rock, pop, musical theatre, country and folk. A great portable instrument, the basic harmonica has remained unchanged since the inception of the free reed instrument in China 2000 years ago. You can put this little gem in your pocket, you don't have to recharge it, take it out whenever the urge hits you and TA DA! – instant music. A 2 hour seminar to put you on the map and give you the basics. At Keith’s workshop you enjoy and amaze yourself and you will make some great new friends held together with ‘harmonic energy’. - the blues scale where is it on the harp? 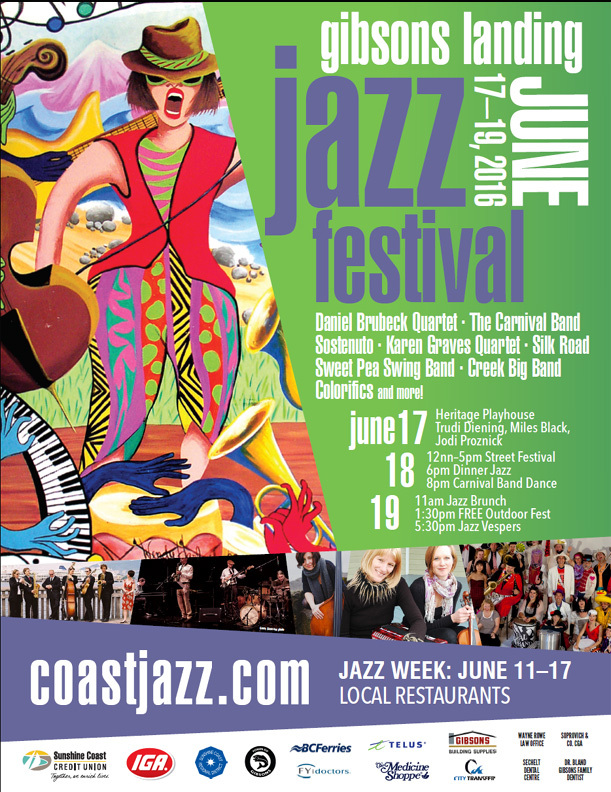 Returning to the Sunshine Coast as one of the original founders of the Gibsons Landing Jazz Festival, Blaine Dunaway, now living on Vancouver Island is a performer, teacher, composer, conductor and plays throughout Vancouver Island with a wide variety of friends. Blaine has worked as a studio recording artist in many studios across the country, and has played in most of the finest Big Bands in Western Canada. As an improvising violinist and trumpet player, there are dozens of albums with his touch adding to the magic, from jazz to classical to folk to world music to blues to popular. Currently he is mastering guitar, keyboards, banjo and mandolin, and rediscovering his singing voice. He also enjoys experimenting with various percussion instruments, his current favourite of which is the WAVE® drum. 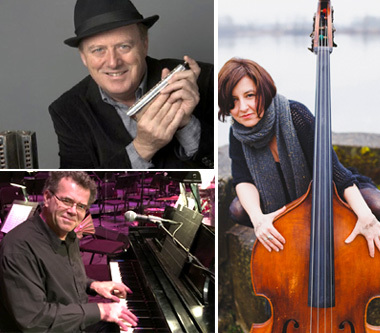 Performing with Blaine will be well known Vancouver pianist, Miles Black; bassist Jodi Proznick, drummer, composer, Kelby MacNayr of Victoria and another well versed musician in the fertile music scene completes the quartet. We're excited to have Blaine and his quartet back on the Sunshine Coast. After spending the year expanding her music career in the UK, Katherine Penfold has returned to the west coast and we're glad she did. As a vibrant singer/songwriter Katherine is a perfect blend of elegance and vivaciousness and will captivate you with a mix of favourite jazz standards from the likes of Ella Fitzgerald and Ray Charles as well as her own original tunes you'll be singing for days. She is here for the first time with her own quartet featuring Jodi Proznick, bass, Miles Black drums and Joel Fountain, drums. Miles Black is a highly respected career musician bringing an enormous wealth of musical experience and expertise to most every facet of the music industry. We are excited to hear Miles be part of this amazing trio. The Sunshine Coast is known for its amazing physical beauty and home of an ernormous number of internationally known creative artists, both visual, written and performing. Daniel Brubeck moved to the 'Coast' a few years ago and we feel so fortunate to have him in our musical community. 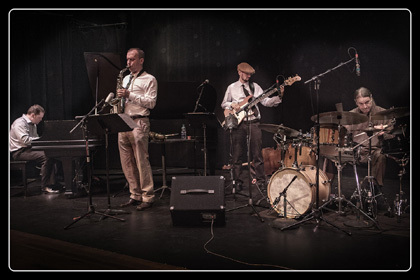 The Daniel Brubeck Quartet is Dan's exciting new group, originally created for performing the music on the "Celebrating the Music and Lyrics of his Dad and Mom, Dave & Iola Brubeck" 2 CD set. The group features the exceptional vocal talent of Adam Thomas (also on bass), with saxophonist Steve Kaldestad, and pianist Tony Foster. Dan was a highly energetic child who found his calling at the trap set. Mentored by two consummate polyrhythmic masters, Joe Morello and Alan Dawson (at the Berklee College of Music), he was working professionally before he finished his teens. Over the years Dan was featured on nearly a dozen albums with his father, and toured widely with the Dave Brubeck Quartet, including many appearances with the world's leading orchestras. He's been an integral part of the various Brubeck bands, including the Darius Brubeck Ensemble, Two Generations of Brubeck, and the New Brubeck Quartet. Dan's drumming style is both mesmerizing and unparalleled, and his distinctive, and astonishingly textured drum solos have received standing ovations all over the world! His uncanny sense of timing and use of odd time signatures, combining melodic phrases with polyrhythms that often stretch far beyond the bar line, has earned the respect of many jazz critics worldwide. 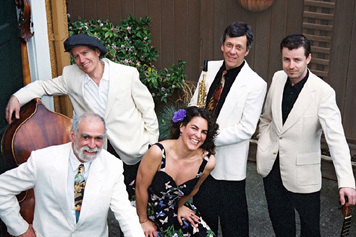 Travel back in time to the early acoustic swing era of the 1920’s & 30’s and experience Vancouver’s most dynamic acoustic roots, world rhythm, gypsy jazz ensembles. Chanteuse Deanna Knight, shares sultry and sassy vocals alongside driving rhythms and hot solos. Described as “stand out, unmistakable and smooth as fine whisky” Knight celebrates over a dozen years with “multi-instrumentalist and ace luthier Michael Dunn and the Hot Club boys who use their Hawaiian, resonator, and Gypsy-jazz guitars to slice and dice 50 shades of swing with admirable gusto.” Rooted deeply in the rhythms of Django Reinhart, this unique ensemble adds to a traditional sound with melody, charm and a memorable vintage flare. Acoustic bassist Charlie Knowles “kicks the cat” with finesse while guitarist Steve “Bugzy” Szabo keeps the rhythms chugging. Martian Ambassador Michael Dunn and new arrival Don Kellett spin their sweet Djangoesque lines on lead slide and guitars, and resident windgod Mark Dowding, keeps those Martian desert winds blowing hot. 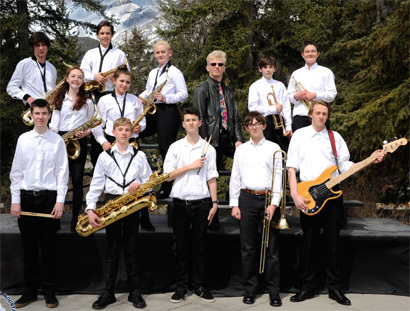 The Elphinstone Jazz Band is a combination musicians from Elphinstone in Gibsons and Chatelech Secondary in Sechelt and conducted by teacher/musician, Tom Kellough and will be performing at the Bus Stop stage to entertain in between acts on the main stage. These young musicians will be at the top of their game as they are freshly back from the Canadian Rocky Mountain Music Festival in Banff. For many it will be their last chance to play with the band before they graduate and move on. 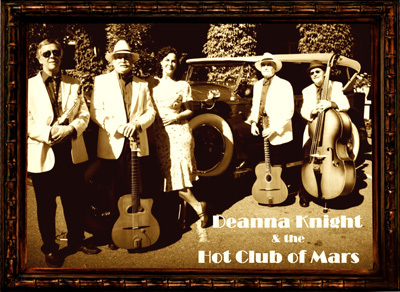 Deanna Knight and the Hot Club of Mars is back for a night of music, merriment and lots of dance at the Gibsons Legion. Deanna weaves her lyrical magic around swing classics, tangos, bossa, boogie and original compositions. Described as “stand out, unmistakable and smooth as fine whisky” Knight celebrates over a dozen years with “multi-instrumentalist and ace luthier Michael Dunn and the Hot Club boys who use their Hawaiian, resonator, and Gypsy-jazz guitars to slice and dice 50 shades of swing with admirable gusto.” Gypsy Jazz from traditional to the unusual will unfold before your eyes and ears. Just try to keep your toes from tapping and staying in your seat. Enjoy a fine buffett style dinner at Emelle's while listening to 'Funktete', a newly formed Sunshine Coast band who are more than just a fun and funky quartet ! Comprised of 4 extremely versatile musicians, coming together to explore the groove. With Karen Graves, on sax, flute and vocals; Anna Lumiere on keys, LH Bass and vocals; Budge Schachte on guitar, bass and vocals; and Regan Haydu on drums and vocals. These pro's play funk, swamp, originals, Latin, Reggae and jump swing with an element of improvisation. They have captivated listening audiences, and packed the dance floor. …..these cats rise to the occasion. This show is collaboration the 'A Canada 150+ Paddling Journey' part of the Canadian Voyageur Brigade Society and the Gibsons Paddle Club. To come and enjoy the band (drinks available) entry is $10 on line or at the door (space limited). Sunday Brunch is certainly a favourite with the Jazz crowd, and this year we are presenting Tom Arntzen, multi-talented singer, pianist, actor. 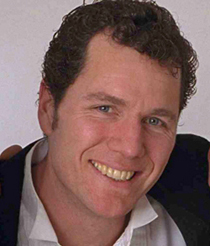 Tom Arntzen is a sophisticated, swinging jazz singer/pianist. The mellow but lively repertoire of this talented musician includes music from Cole Porter, Gershwin, Duke Ellington and other composers of the great American song book, in addition to contemporary favourites. Tom Arntzen is also an excellent vocalist, performing in a croonin' Frank Sinatra-style. 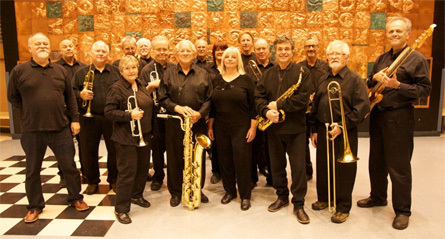 The Creek Big Band loves to play big band swing, jazz, blues, and latin music for listening or dancing. It is made up of unpaid volunteer musicians who contribute their time and talent for the benefit of Sunshine Coast music students and audiences. The money earned from their paid performances goes toward scholarships for Sunshine Coast students going on to further music studies, and toward miscellaneous band expenses. Their leader is Graham Ord and they are graced with vocals by Crystal Spence. Other members of the Creek Band are: Lead Alto - Carl Montgomery, 2nd Alto - Lorne Berman, 1st Tenor - Cherry Bolognese, 2nd Tenor - Graeme Green, Baritone sax - Ken Grunenberg, 1st Trumpet - John Frederickson, 2nd Trumpet guest - Walter Martella (Solo Trumpet), 3rd Trumpet - Karin Tigert, 4th Trumpet - Ken Huffman, 1st Trombone - Bryan Airth, 2nd Trombone - Bill Wishlow, 3rd Trombone - Jim McGowan, student guest Sage Swann (from Elphi) 4th Trombone - Gord Catherwood, Guitar - Dave Morgan, Piano - Carolyn Mitchell, Vibes - Val Anderson, Bass - guest Jack Cooper, (Elphi Student) Gord Beynon, Drums - Al Burns, guest Regan Haydu. Drawing on his thorough study of classical guitar, Celso composes for guitar and ensemble. 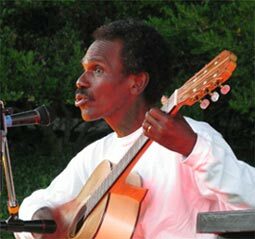 His remarkably innovative compositions are infused with a rich knowledge of the traditional music of Brazil: samba, chôro, baião, frêvo etc. His compositions are performed and recorded by both students and professionals around the World, from solo performances to guitar orchestras. A perfect way to close the day and get up and dance to the Rakish Angles. Back by popular demand the Gibsons Jazz Festival is joining St Bart's Church in Gibsons to present 'Jazz Vespers - In the Key of Love'. A tradition in many towns and cities, Gibsons now joins the tradition in the fabulous acoustic and spiritual space of St Bart's Church. This year one of Sunshine Coast's favourite vocalist Jacquie Allan is joined by Vancouver's Karen Plato. 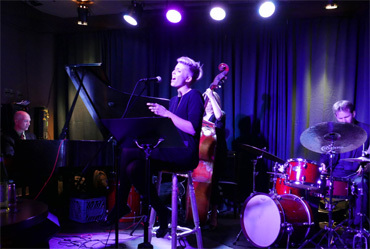 Karin recorded her first album of jazz standards and originals in 1996 and has continued recording ever since to high acclaim in the Jazz world. These two singers have performed together on the Sunshine Coast in the distant past so we are very excited to hear them together again at this year's Jazz Festival. Accompanying this vocal duo will be our own Ken Dalgleish on piano and Ron Thompson guitar. This is a great way to soak in the final jazz sounds of this years Gibsons Landking Jazz Festival.